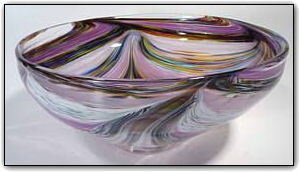 This bowl is from the End Of Day Series and features many shades of purple, as well as colorful rainbow accents made with a variety of colors used throughout the day. Make sure to zoom in to see the breathtaking beauty and detail of the many colors interacting with each other. Both the exterior and the interior are simply amazing!